ResinLab’s laboratory is equipped to characterize polymers and formulations including potting compounds and adhesives. 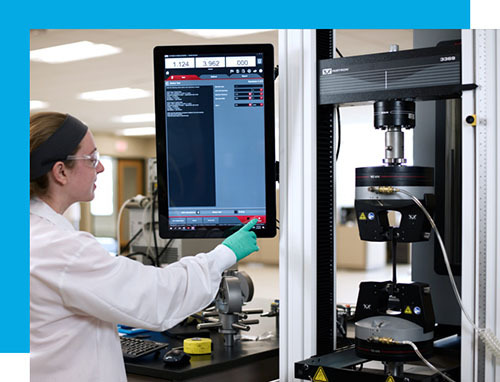 These capabilities support new product development, technical service, and quality assurance. The laboratory team is also available for contract lab services and custom formulation consulting work. Cross-sectional surface analysis of a cured material is possible for specimens with thickness less than 3 mm. Test specimens must be solids. 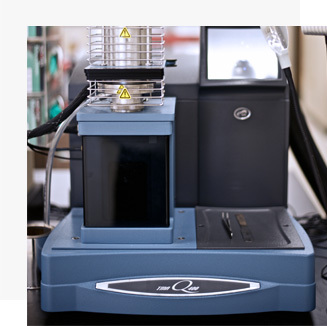 Our Malvern Gemini 2 Bohlin Rheometer, can perform standard viscosity measurements as well as cure response. Equipped with a thermoelectric heating and cooling plate, it can enable isothermal and programmed temperature schedules, operating from 10 to 120 °C at a wide range of shear rates. ResinLab also utilizes the Gardco Gel Timer and Gardco Hot Pot Gel Timer to generate a gel time value for a 150 cc or 100 cc sample. The Gardco Hot Pot Gel Timer can cure at ambient room temperature, as well as elevated temperatures ranging from 65 to 175 °C. 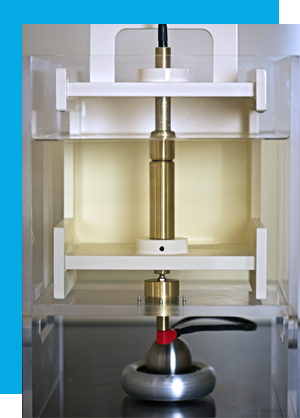 The digital Brookfield DV-II Viscometer aids in measuring viscosity. 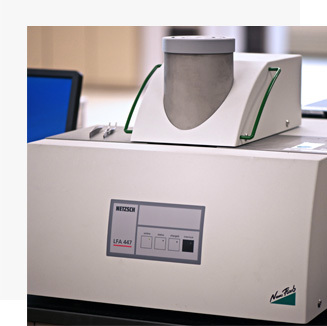 Our TA Instruments Q400 Thermomechanical Analyzer (TMA) measures the dimensional changes of materials under conditions of controlled temperature, time, and force. The temperature range of the instrument is -50 °C to +350 °C. Test specimens should have parallel faces and will ideally be 1-10 mm thick. A small piece that is roughly 0.7 cm by 0.7 cm is the maximum size capable of sitting on the stage. The temperature range of the instrument is -150 °C to +550 °C. 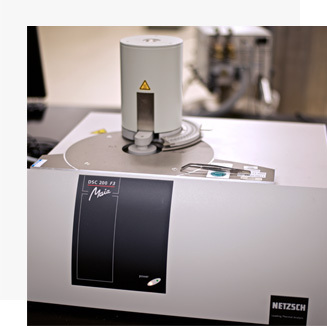 Our Netzsch 447 Nanoflash Laser Flash Analyzer (LFA) measures heat transport properties of polymer formulas including liquids, greases, solids, and multi-layer samples. 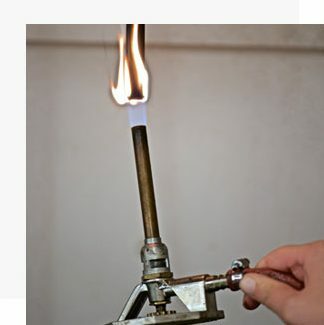 We also are equipped to perform UL94 testing, both vertical (UL94V) and horizontal (UL94HB) burn methods, with capability to cast bars at 3 and 6 mm. Please note that ResinLab is not a certified test laboratory, and UL certifications cannot be provided by ResinLab. These tests provides data that support the pursuit of certification. 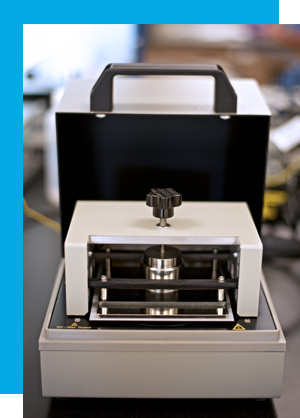 Our Nicolet iS10 Attenuated Total Reflection Fourier Transform Infared Spectrometer (ATR-FTIR) generates a fingerprint of a sample’s chemical functional groups. 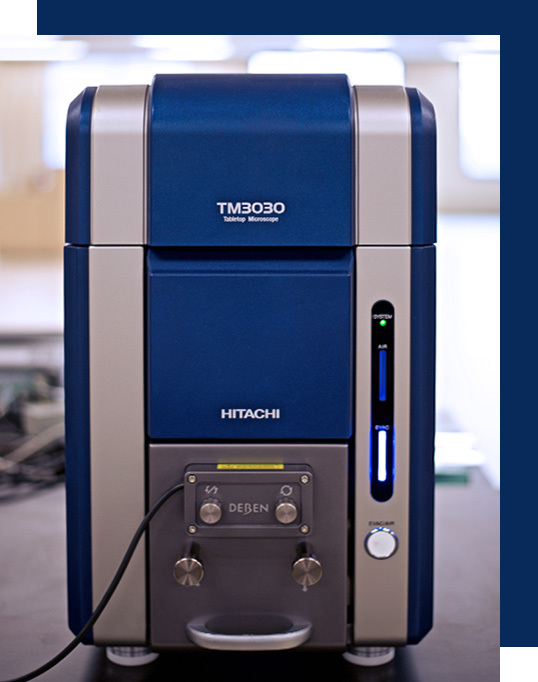 The ATR attachment enables non-destructive analysis of the sample. Our Instron 3369 Universal Tester measures a wide variety of properties across a full spectrum of materials including plastics, metals, ceramics, textiles, adhesives, elastomers, foams, and more. We also have an Instron 3119-615 Environmental Chamber with a temperature range of -100 to +350 ­°C. It is tall enough to allow for tensile testing of materials with a significant elongation to break. We can measure a wide range of polymeric materials, including tough, high hardness epoxies and urethanes, and softer silicone elastomers. We also have Shore Durometers in the D, A, and OO scales available to measure material hardness. 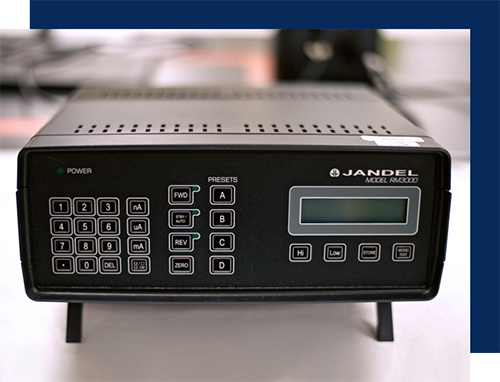 Our Jandel RM3000 is a 4-point probe that can measure electrical properties of both thin film and bulk materials, including electrically conductive adhesives. Our Keysight B2985A Resistivity Meter with 16008B Resistivity Cell can measure volume and surface resistivity of electrically insulating materials. Temperature and humidity are measured in tandem with resistivity. The test meter is specified for use from 0 to 55 °C at less than 70 % RH. Values are typically generated at a source voltage of 500 V. A typical sample size is a 4” by 4” square with a thickness of 3 mm. The two faces of the square should be as flat and parallel as possible. 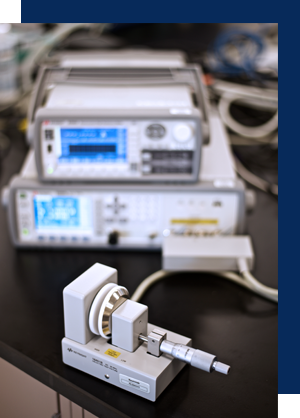 Our Keysight E4908AL Dielectric Constant Meter and 16451B Test Cell measures dielectric constant (relative permittivity) and dissipation factor (tan delta). The test cell can be used at temperatures ranging from 0 to 55 °C. The test meter can provide measurements in the frequency range 20 Hz to 300 kHz. 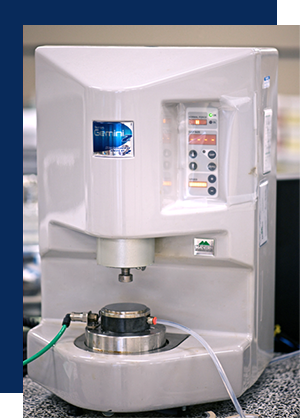 To generate accurate and reproducible results, the fixture requires disc-shaped specimens with thickness less than 10 mm, with 2 mm or less ideal, a diameter of 40 to 56 mm (1.6 to 2.2 inches), and surfaces as flat and parallel as possible. Our Phenix 4TCE100-10/D149 DC Dielectric Strength Tester measures the dielectric strength, or voltage required to generate failure, in insulating materials. We have Type 2 and Type 5 electrodes and a room-temperature oil bath with transformer oil that conforms to ASTM D3487 Type II. The unit can source voltages up to 100 kV with minimum ramp rate of 500 V/s. Samples must be thin and flat with parallel faces. When using the Type 2 electrodes, the specimen must be at least 2” in diameter. Each specimen must also be thin enough to fail within the maximum range of the unit, which usually corresponds to 2 mm or less thickness for the most highly insulating specimens. 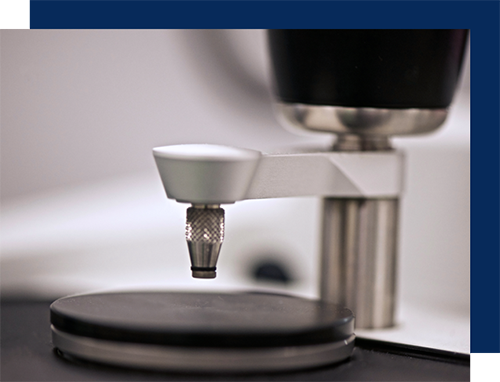 For more information about our testing and characterization lab services, contact us today.